Xiamen University Malaysia Campus (XMUMC) is the first overseas campus set up by a renowned China university and the first China university branch campus in Malaysia. Located in the vicinity of Bandar Kota Warisan, Sepang, Selangor, it's just 15 minutes ride from the country's administrative center of Putrajaya or 45 km southwest of Kuala Lumpur. It is built on an area of 150 acres with a planned total floor space of 470,000 square meters. XMUMC aspires to become a university with a distinct global outlook, which features first-class teaching and research, and embraces cultural diversity. With the exception of Chinese Studies and Traditional Chinese Medicine, the medium of instruction for all other programmes is English. 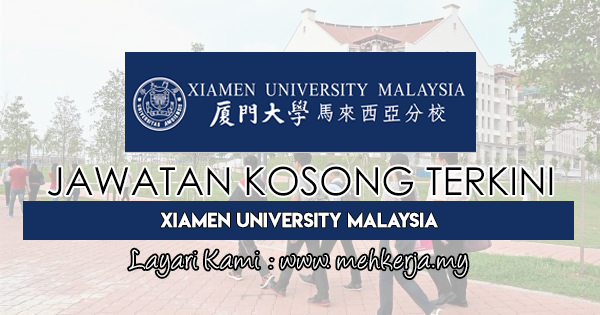 0 Response to "Jawatan Kosong Terkini di Xiamen University Malaysia - 9 September 2018"